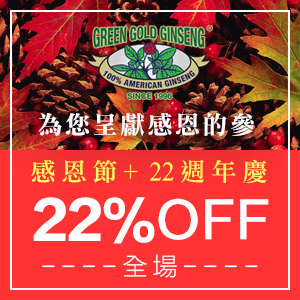 Green Gold Ginseng offers 22% off sitewide Green Gold Ginseng Authentic American ginseng from our own farm. Alipay and Wechat Pay are available very soon! For every $100 you spend, get 1 oz of ginseng fiber for FREE. Buy more get more! No promotion code is needed and cannot combine with other promotion. Fresh products and wild ginseng are excluded from this offer. 4oz bag packages are NOW Available!!! Best choice as a gift or self-usage. American ginseng is the favorite and top choice by ginseng consumers, while the taste of its ginseng has a sweet aftertaste. The texture is hard which makes it resistant when making tea. It is the best choice as gifts. American ginseng needs to be planted in a virgin land with specific soil and weather conditions. In order to ensure good quality, the yield is much less than that of Canada and China. 3G ginseng is definitely the most cost-effective and decent choice! It’s harvest season, our cultivated fresh American Ginseng is the best choice for you to boost your health and energy in the fall and winter. Fresh American ginseng preserves the most nutrition and is very convenient to use and cook. Comparing to the dried American ginseng, it kept 14% more useful elements and nutrition than the dried roots. Fresh America ginseng can also cook with chicken, bones or fish with soup. On the other hand, it is good to make your own wine with fresh American Ginseng. With this King of Herb, you can live a heathier fall and winter! Make your own wine and put 50 to 80 g of fresh American ginseng and 500g of wine with at least 50% Alcohol by volume for around 3 months, take a shot every night and maintain your health. Fresh American Ginseng can be kept in the refrigerator for 2 to 4 weeks. You can use kitchen towels to wrap the Fresh American Ginseng and put them into the bag. Check every few days to see if the kitchen towels are wet and replace the kitchen towels once in a while. If the Fresh American Ginseng cannot be finished within a month, you can pack and store it in the freezer according to your usage every time. You don’t have to defreeze the Fresh American Ginseng and just put it with your ingredients and cook without defreeze. American Ginseng Prong 8oz bag is the best for making soup or tea by yourself! American ginseng can be kept for two to three years in a dry and cool condition. Suggestion: 2 to 4 grams for an adult per day. American Ginseng is not classified as a drug. Please consult your physician if you have a potential or existing medical condition. Green Gold Ginseng, or 3G, was founded in 1996 and is located at the town of Marathon in Marathon County, Wisconsin, which is renowned for its fertile soils as well as suitable weather condition. American Ginseng is the perfect healthy food. It has traditionally been used to improve energy levels without causing overstimulation or overheating of the body. Local climate and soil are critical to American Ginseng's growth and taste. Normally it takes 3-5 years before our ginseng roots are harvested. What makes ginseng from Marathon County so special? Why are the vast majority of American ginseng farms located in Marathon County, Wisconsin? The answer is simple: because of our unique location at the 45th parallel we have long winters, heavy snow, and soils high in mineral content.